One of the great things about working in Admissions is that early September, with its typical end-of-summer and back-to-school pageantry, is far more focused on new beginnings than a sad adieu to long days, flip flops, and the smell of sunblock. While it’s true that it gets mighty busy mighty quickly around here, there’s a special energy that comes with the arrival of a new class, and the return to Fletcher of second year students. Jessica has already shared some details of the goings-on at last week’s orientation, and this week sees the start of classes. In short, it’s on! Things get going today with “shopping day,” in which students have the chance to check out capsule presentations of new and seminar courses before the start of classes on Wednesday. 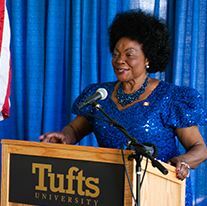 Friday brings Fletcher’s annual Convocation, featuring keynote remarks by Dean Ian Johnstone and former International Criminal Court Justice and Fletcher alumna Joyce Aluoch (F08). On our end, as usual we’ll spend much of the fall on the road, and we’re working away on the various logistical tasks associated with a busy travel schedule. First on my personal agenda: APSIA events in Philadelphia and Washington DC. See you there, perhaps? So happy September (whether or not your life adheres to an academic calendar)! We’ll all be looking forward to seeing you and being in touch throughout the fall.